Nollywood actress, Mercy Aigbe is celebrating the birthday of her son, and last child, Juwon today, June 18,2018. Both mother and son have decided to show off their cooking skills as the cook in large quantity for the grand birthday party of Juwon Gentry. 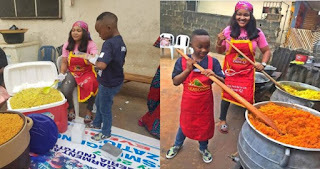 They were both pictured in their cooking aprons, and the celebrant was seen assisting with the mass cooking for the kids who would be hosted later in the day.